In order to permanently limit pollutant emissions and transition to a low- and zero-emissions economy, the European Union compels to introduce significant changes in the energy mix already at the beginning of the next decade, i.e. since September 2021 to limit emissions of sulphur dioxide, nitric oxide, mercury and dust on the basis of the so-called 2020 BAT conclusions, writes Christian Schnell, PhD, legal counsel, Instytut Jagielloński’s expert. The current state of works carried out by energy companies with regard to the adaptation of their conventional power stations and CHP plants to the new emissions limits suggests that as of 2022 the stability of the Domestic Power System may be threatened if the we do not manage to quickly agree on the rules for public aid with the European Commission – capacity market, cogeneration support systems and RES – in order to start new investments. When it comes to the state-owned energy groups, it is mainly PGE that fulfills the duties to adapt the existing coal units to the new limits. This costs billions of Zlotys. However, the other members of the ‘big four’ so far have had less ambitious plans. Similarly private investors seem reluctant to adapt their coal-fired power stations. This means PGE will be the main beneficiary of the support for coal units, the so-called strategic reserve, which according to the EU’s fourth legislation package will be binding until 2025. PGNiG Termika, in cooperation with Enea and maybe Energa, is planning to invest in gas-fired units, which will benefit from the capacity market especially as of 2026. PGE is also building and planning such units. The investment cycle suggests that as of the middle of the next decade power generated by gas-fired power stations will significantly increase. The same will happen for CHP plants, but earlier. Extremely high investments in heat and power stations are needed, because after a 4-year transition period the heat systems in a number of big cities are missing heat, the time left for a action is so limited that there literally seems to be no alternative to gas-fired power and heating stations. They should be supported by smaller cogeneration units that use biomass or biomethane. The demand for new CHP plants in the first half of the next decade will reach up to 4 GW of power alone. The Industrial Emissions Directive (IED) entered into force for all EU countries at the beginning of 2016. The IED’s regulations and BAT conclusions significantly tighten the emission standards for sulphur dioxide, nitric oxide, mercury and dust from combustion plants and apply not only to new generation units, but especially to the existing ones. A significant portion of Polish power plants and CHP plants will not be able to meet the BAT conclusions’ requirements in their current technical condition. The units that have not been included in the postponement (Transitional National Plan – TNP – for units commenced before 2003, or the so-called natural derogation or heating derogation) of the application of the new emissions limit were excluded already in 2016. Nevertheless, a significant majority of older units have been encompassed by the TNP and/or natural derogation. Additionally, the IED stipulates that between 1 January 2016 and 31 December 2023 the units submitted for natural derogation cannot be used for more than 17500 hours, i.e. about 1.3 of their normal usage time. It is obvious that the usage of a unit for about 2100 hours a year would generate bigger costs than profits, which is why the majority of operators will decide to exploit the units without interruptions (depending on the technical state) and will use the 17500 hours within, e.g. 4 years and shut down the chosen units. The Polish government presented and the European Commission approved the Transitional National Plan, which encompasses 48 energy facilities, for which the application of tighter emissions limits has been postponed until 30 June 2020. 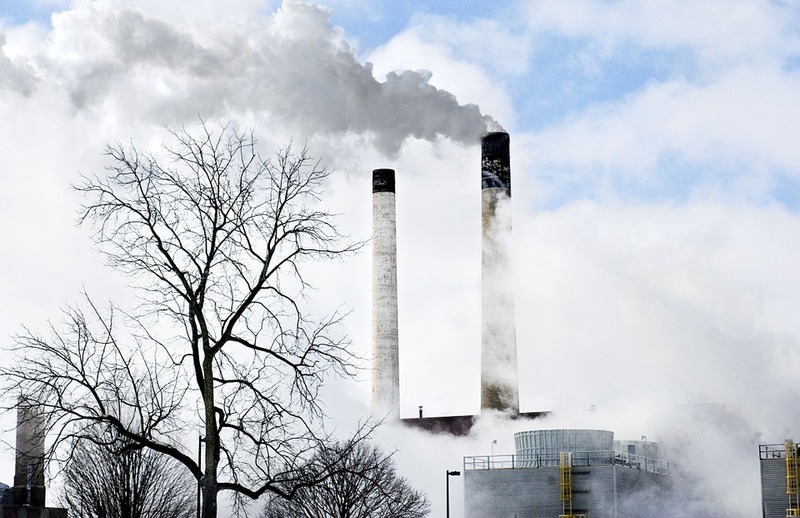 Each facility received a designated level of admissible emissions. 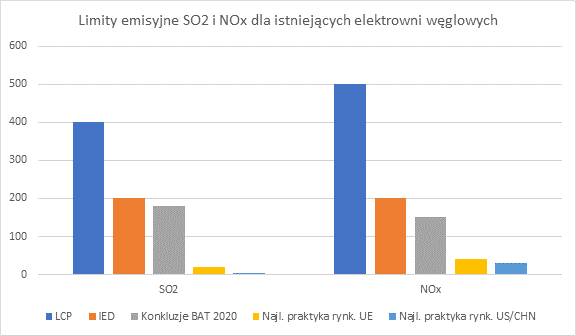 The Polish government promised that between 2016 and 2020, the sulphur dioxide emissions would be reduced by 80%, nitric oxide by 68% and dust by 82%. The current 2020 BAT conclusions standards for the existing facilities with a total capacity of over 500 MWt are rather mild and differ a lot from the best market practices in the EU, the United States and China. This is why the next generation of the BAT conclusions as of 2030 will include ever stricter limits. Comparison of emission limit values in mid-year terms for (mg/Nm3) SO2 and NOx for existing large combustion plants that use coal – the rated thermal input of the fuel >500 MWt. Blue bar – LCP directive (as of 2007), yellow bar – IED (as of 2016), grey bar – BAT conclusions (as of Sept. 2021) for existing facilities, yellow bar – EU best market practices, blue bar – US and China best market practices for existing facilities. The BAT conclusions will directly impact those Polish installations, which require renewed integrated system of energy production permits. The emissions produced by those installations should especially fit into the limits of the emissions standard which was specifically designed for such installations, it is called “emission limit values.” When it comes to the installations that are already functioning the competent institution authorized to issue an integrated permit will analyze its conditions no later than within 6 months from the day the BAT conclusions will be published in the EU’s Official Journal, i.e. 17 August 2017. If the analysis reveals that the integrated permit needs to be changed, which will happen as part of an administrative procedure with the participation of the society (including environmental organizations), the institution will inform the operator of the installation about the necessity to adjust the installation to the conclusions and will ask them to submit an application for changing the permit within a year from the moment the summons was delivered. The scope of the application should answer to the changes that need to be made in result of the analysis. The decision on changing the permit should include a deadline before which the operator must adapt the facility. However, the time available cannot be longer than 4 years after the BAT conclusions are published in the EU’s Official Journal. Whereas the installation that will acquire the new integrated permit has to be shut down before 17 August 2021 at the latest. Is it possible that exceptions to the BAT conclusions issued under certain conditions could turn out to be a helping hand to the installations? The IED and the domestic regulations provide for temporary exceptions to meeting the emission limit values defined on the basis of the BAT conclusions. However, it is worth pointing out that this is not an exception to all BAT requirements, which means it does not apply to, e.g. the rules for monitoring or to all of the emissions limits. The exception can be applied because of disproportionally high costs of adapting the installation to the emission limit values in relation to the benefits for the environment. The analysis that precedes the granting of the exemption should include the geographical location, local environmental conditions, the facility’s technical characteristics, or other factors that impact the installation and the environment as a whole. The criteria mean that the operator of the installation who applies for the exception will have to prove that their installation is not a model facility on the basis of which the BAT conclusions were designed and the costs of adapting it to the BAT conclusions are disproportionate in relation to the benefits for the environment. The exception means the time-limit for adapting to the stricter emission limit values will exceed the statutory 4 years – in case of some emission limits for some generation modes, e.g. only heat. The postponed deadline will be proposed by the institution in the decision on changing the integrated permit. The strength of the arguments included in the application will decide whether the institution will agree that the conditions for granting the exception have been fulfilled. According to analyses ordered by Towarzystwo Gospodarcze Polskie Elektrownie, the adaptation to the BAT conclusions will cost roughly PLN 10 bn. At the same time it should be noticed that energy companies have already incurred significant costs to adapt to the standards introduced in 2016. Earlier, the Ministry of the Environment said it would cost PLN 12.2 bn. However, while building the case for an exemption, one should bear in mind that companies such as PGE, CEZ, Energa or Tameh are already booking contractors to adapt their installations to the BAT conclusions, which means it will be impossible to prove the adaptation costs are disproportionate in relation to the benefits for the environment. Additionally, it should be remembered that the European Commission will soon publish guidelines explaining what circumstances allow for grating an exception on emission limits – we already know that it will be impossible to grant the exception to the majority of installations.